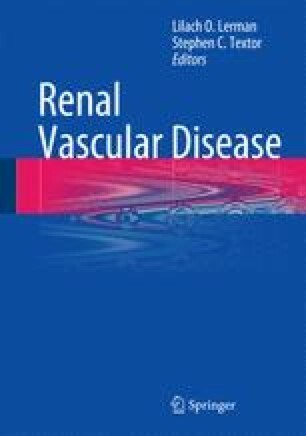 Renovascular hypertension (RVH) is an important cause of both renal and cardiovascular morbidity and mortality. Atherosclerosis is the most common etiology underlying the development of RVH. In the stenotic kidney, the development of interstitial fibrosis and tubular atrophy is associated with the influx of inflammatory cells. These morphologic alterations result from a complex interplay of several pathways involving the renin angiotensin system, oxidative stress, the TGF-β-Smad signaling pathway, and the mitogen-activated protein kinase (MAPK) pathway, leading to both local and systemic production of chemokines that promote ongoing inflammation and interstitial fibrosis. In this chapter, we will summarize recent human and experimental studies to determine how these signaling pathways interact and contribute to renal inflammation and fibrogenesis. Identification of these pathways will provide a mechanistic basis for the development of RVH and may provide the basis for novel therapeutic targets directed towards arresting the progression of renal disease in patients with renal artery stenosis.